Let me just say that it was not my intention to make Applesauce Spice Cupcake Pudding when I started putting together the butter, flour, applesauce, and spices. I had a recipe that came from my sister-in-law for an Applesauce Spice Cake that I was trying to adapt into cupcakes. I learned something new right off the bat. Not all cake batters translate to cupcakes without some kind of adaptation. Rather than rise up into a nice rounded top, the batter spread out over the surface of the cupcake sheets and stuck there, making it impossible to remove the cupcakes from the sheets without the tops pulling off of them. The cupcakes were of a moistness that would have made for a rich, marvelous cake, but it was a sticky moistness that made getting them out of the paper problematic once I did manage to get them out of the baking sheet. In other words, one big fat mess of a failure. I knew I could not cover them with the cream cheese frosting that is supposed to accompany them. I also knew that I could not share them with anyone in their current state. But I had two dozen of them and I couldn't just throw them away. Other than their appearance, there was nothing wrong with them. I put on my thinking cap. I was determined to make some kind of lemonade with those lemons. Maybe it's the time of year, but it was just a tiny little stretch to come up with bread pudding. I had seen Ina Garten make one with croissants, so I knew you didn't have to use bread. You just needed something bread-like. These were perfect. They were already broken up, it shouldn't take too much effort to break them up even more. All I needed was a little something to bind the broken pieces into a whole. I looked through some of my old standby cookbooks and found a basic bread pudding in The Settlement Cookbook that was about as simple as could be. Milk, eggs, sugar and spices mixed together, poured over the broken up cupcake pieces, left to soak for a while, then baked for about an hour. It seemed simple enough. It was simple, and delicious. I used the same spices for the pudding as I had used for the cake, and it was nice and warm and spicy. But it needed a sauce, something to contrast a little with the soft texture and spicy taste. As soon as I thought of caramel sauce I knew it would be perfect. I'd never made caramel sauce before, so I went looking for recipes. I found the perfect recipe here on Elise's Simply Recipes. It came together quickly and was warm and buttery and sweet and rich and - for lack of a better word - caramel-y. In a word, yum. In two words, yum yum. It was the perfect accompaniment for the spice cake pudding. It's buttery warmth wrapped around the spices in a velvet coat of sweet, rich flavor. I'm not going to post the Applesauce Spice Cake recipe here - when made properly it should be served with the cream cheese frosting that usually goes with it and it will be delicious in its own right. What I am posting here is a recipe for turning any cake/cookie/baked good disaster into a triumph. 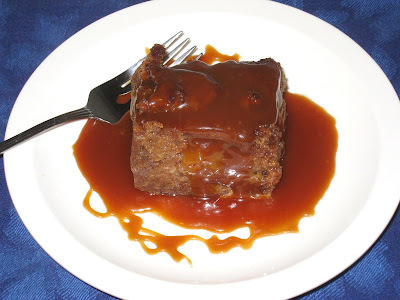 Served with this luscious, gooey caramel sauce, you can even use regular old stale bread, which was the reason bread pudding was created in the first place, to find a use for that old, stale bread that had hung around the kitchen for a day or two too many. 1 tsp cinnamon, nutmeg, allspice, ginger, or any other spices that you want to use; you can mix and match spices and amounts, but no more than 3 teaspoons of spices in all. Place bread/cake cubes into a greased 1-1/2 quart baking dish. Beat together the milk, eggs, sugar and spices. Pour over the bread/cake cubes and let stand until the liquid has been thoroughly absorbed. Bake for 35-40 minutes, until firm. Let cool before serving. Loosely adapted from The Settlement Cookbook, Third Edition, Newly Revised (Simon and Schuster 1965, 1976).